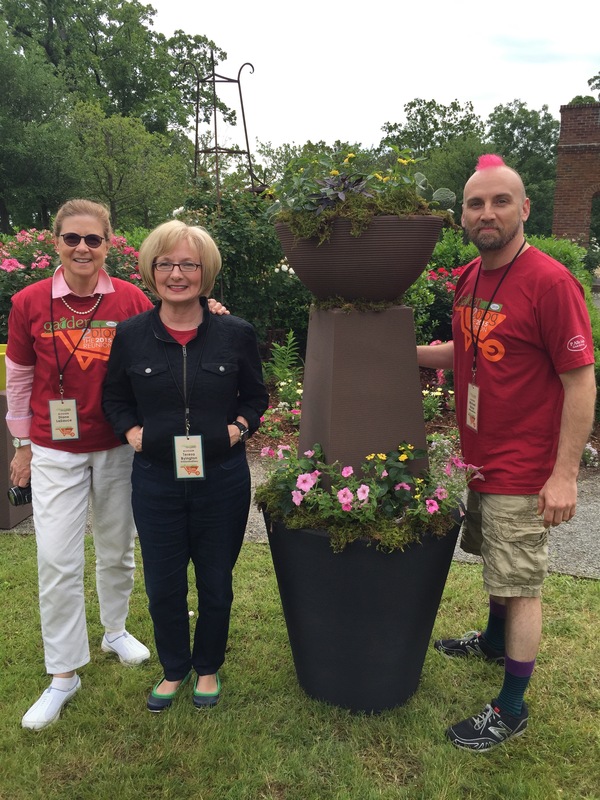 As most of you know, recently I had the grand pleasure of meeting with so many of my garden blogger friends in beautiful, historic Little Rock, Arkansas for Garden 2 Blog 2015. Our time in Little Rock started at the gorgeous Capital Hotel—considered the front porch of Little Rock. I can assure you they roll out the red carpet for their guests! Our ultimate destination was P. Allen Smith’s Moss Mountain Farm, or as I often refer to it as “Gardener’s Mecca.” The Arkansas red carpet just keeps rolling. Moss Mountain Farm offers you beauty filled with focus — their focus is on farming/gardening/decorating inspiration, information and conservation. Whether you are into heritage poultry, flowers and bedding plants, herbs, vegetables, home decor, test gardens, sheep, or … or… or.. (you get the picture! ), you will find it — all on a mountain top that overlooks the Arkansas River. For this garden girl raised in the mountains, it is a balm for the soul. In addition to our beautiful surroundings, there is the wonderful food, decor and oh the friends! As you know I am a bit “crazy” over gardening, imagine how much fun it is to be face-to-face, arm-in-arm with a bus load of “like minds.” Over the top! 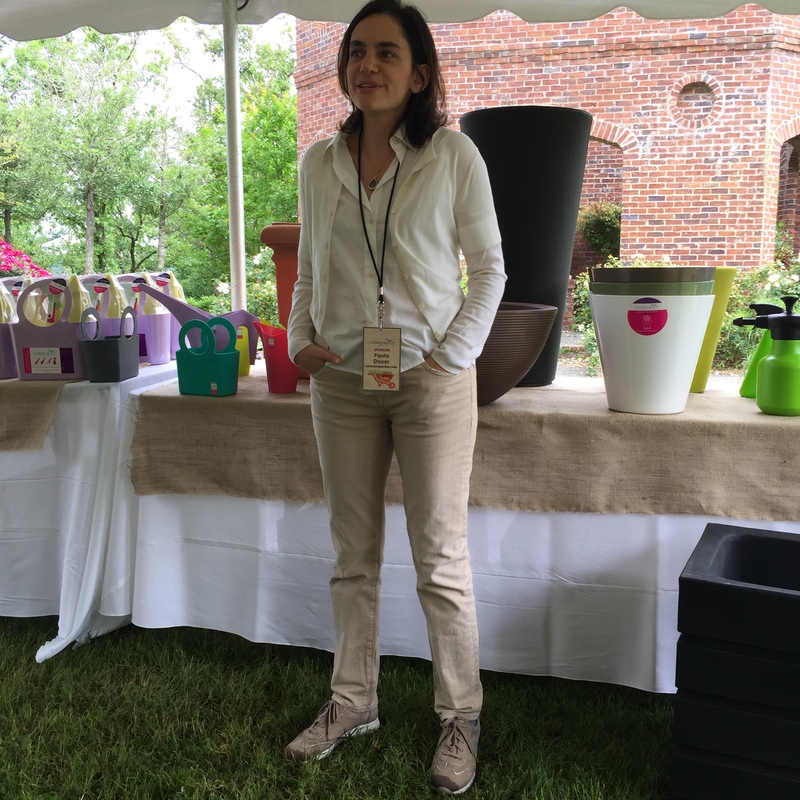 We are completely “spoiled and pampered” by P. Allen, his crew and our wonderful sponsors who share with us information not only on their products but what’s coming up and trends they are seeing in the gardening world. Bonnie Plants, now leaders in the industry, began in 1918 as a family business of Bonnie and Livigston Paulk in a small Alabama town. Lois, Su, Byron and Amanda led us through the fascinating world of the tomato! What gardener wouldn’t “relish” the chance to get all nerdy just diving into the subject of tomatoes!?! And if you haven’t already, download their iPhone app… we did! 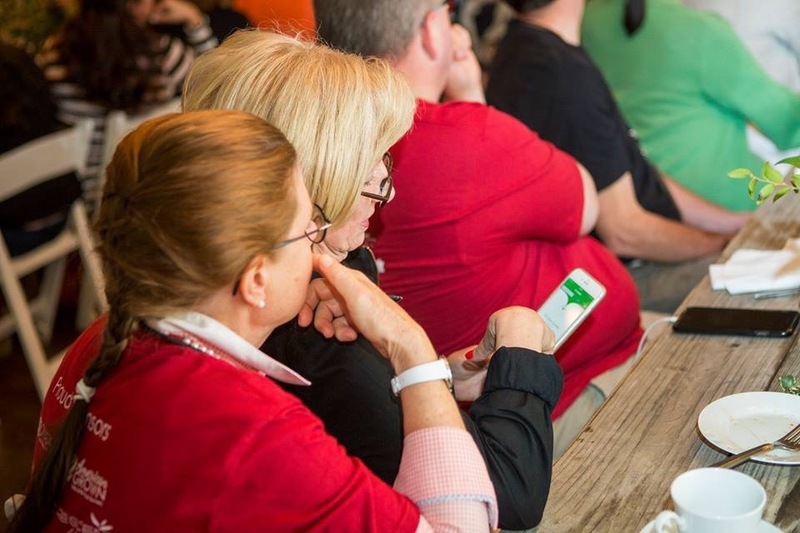 Me and Diane LaSauce checking out the app! We were impressed! The American Grown brand is a diverse coalition of U.S. flower farms representing small and large entities across the country to provide beautiful cut flowers and foliage. 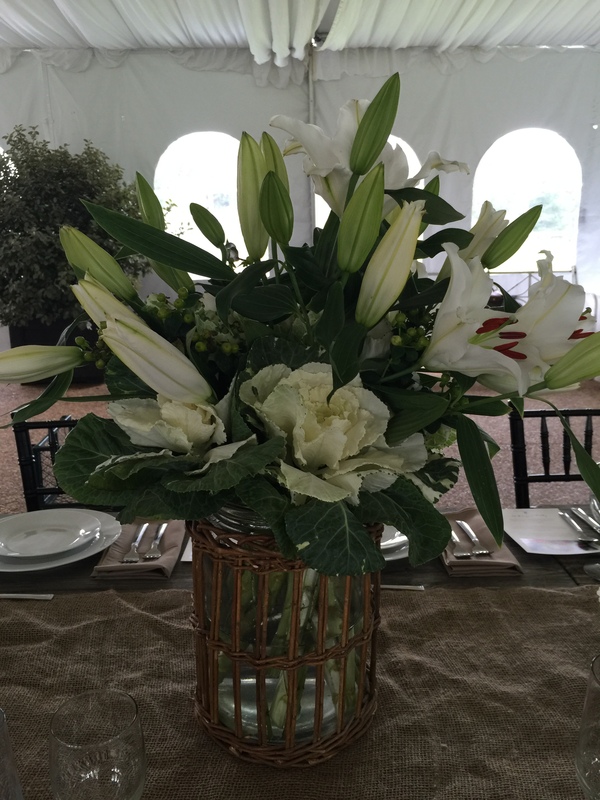 Kathleen Williford and company knocked our socks off with their amazing designs at the “FARM TO VASE DINNER”. 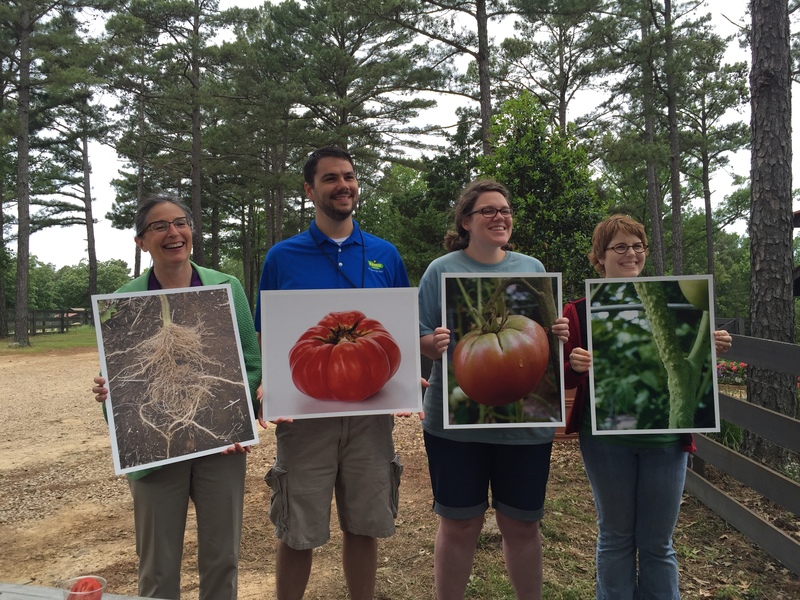 Read more about their tour schedule for Farm to Vase dinners here. http://www.americangrownflowers.org/fieldtovase/ There just might be one coming to a farm near you! Paula of Cresent Garden did a fabulous job telling the story of her family’s moving from Columbia and coming to America–her land of opportunity! Crescent Garden has containers for every need … Their beautiful line of containers is very deceiving. They look so “real” that you expect them to be very heavy. But, these products are lightweight, durable and will fit into any landscape. Paula Douer, Mark Rosas and Cesar Castillo shared their company story and led us through fun design exercises showcasing their amazing products. Go team Diane, Teresa and Michael! Elegant design don’t you think? 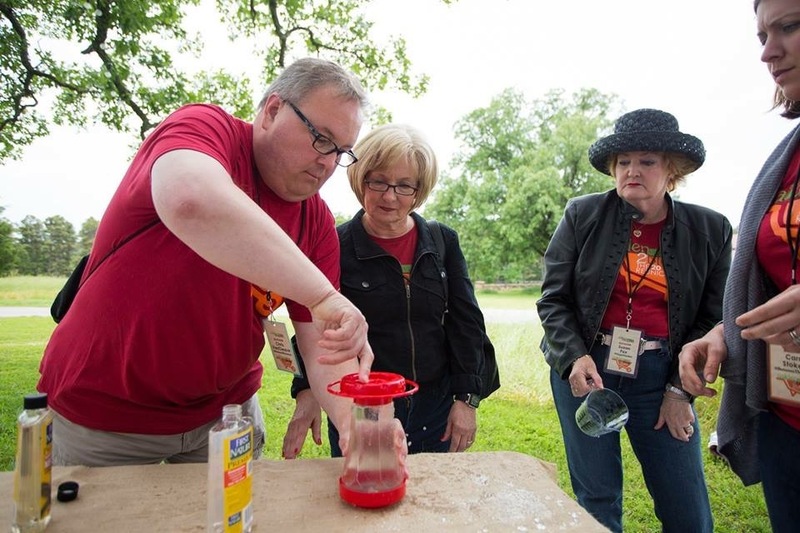 Who can fill the First Nature bird feeder the fastest?? Highly functional, affordable, easy to use and easy to clean products that will be very attractive to the birds in your life! Joe Murfin and his team shared their commitment to quality for all of their American made products. A no-kink, highly flexible hose—need I say more! In a color that will allow you to make your own garden fashion statement! 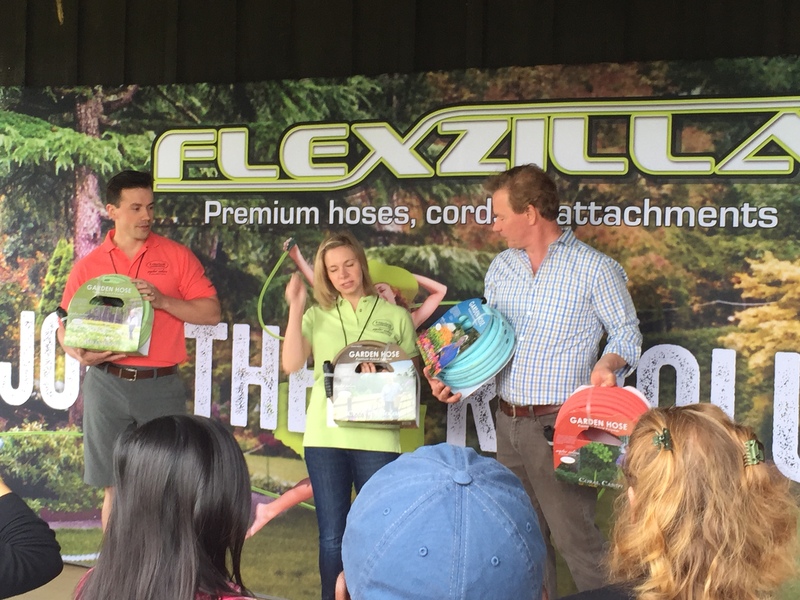 Corbin Mollman, Rachel Perez and Andy Perez were with us to demonstrate this amazing garden hose … one that is safe for drinking and can be left out in the cold! I always love to hear from Jobe’s Organics. 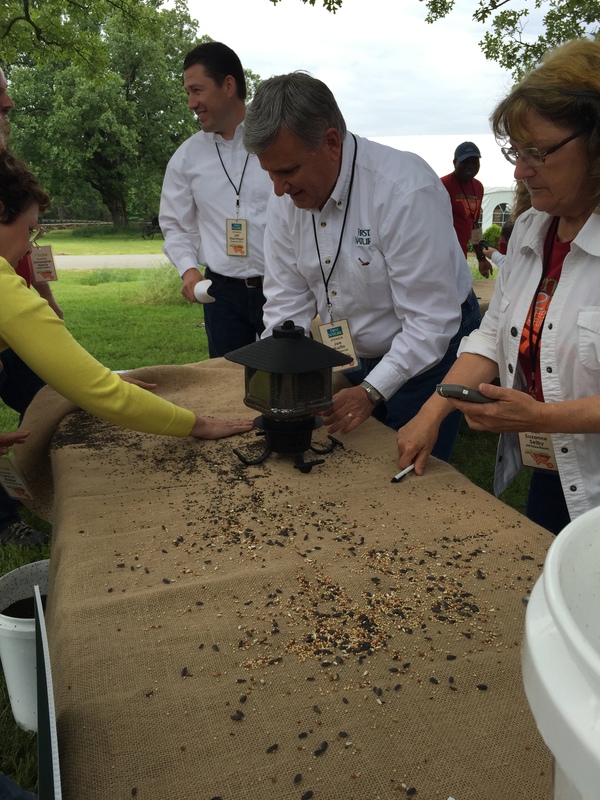 They are doing so much to bring us the very best in organic fertilizers. Clemente Conde, Jen Neve, Martin Rainey and Rebecca Cantu reminded us of how important it is to take good care of our soil. Jen, project director for Oppenheimer Biotechnology, shared with us what they have learned from their work in oil spill cleanup and leaving the soil better than it was before! Tracy Lee and Alecia Troy shared with us what is going on with this 100-year-old seed producer headquartered in Morgan Hill, CA. We had the opportunity to choose seeds to take home and try! You can find these seeds on retail seed racks and via mail order seed catalogs! More here. Home for farm fresh flowers, based in Humboldt County, CA, where the foggy conditions are perfect for tulips, irises and stunning Oriental and hybrid lilies—one being my personal favorite—the Stargazer Lily! Take a look at some of the beautiful flowers provided for us by Bill Prescott and the good folks at Stargazer Barn. These Stargazer Barn lilies were spectacular! Thanks for stopping by. 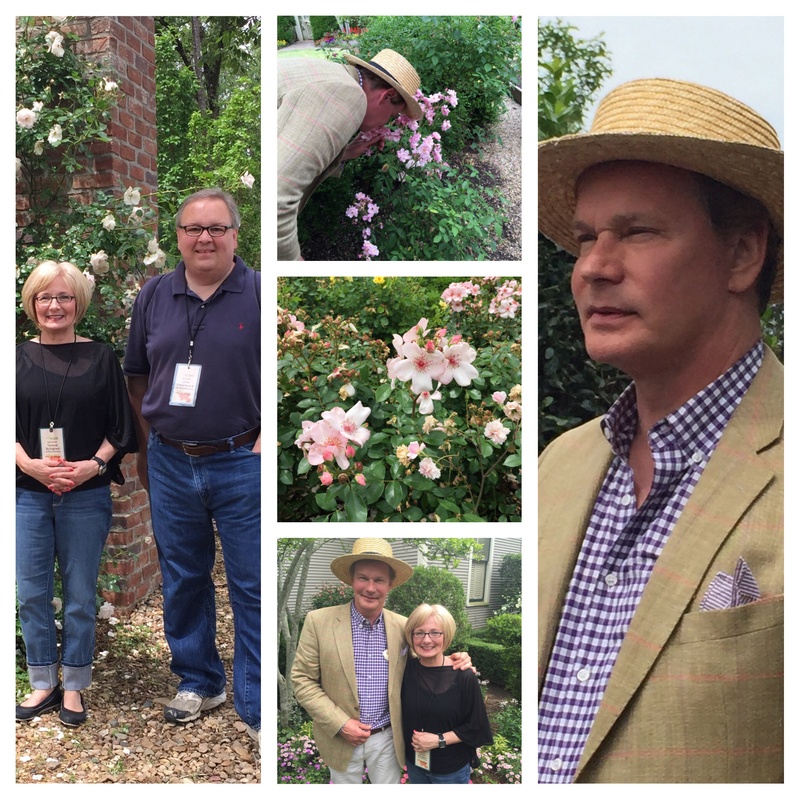 P. Allen Smith’s rose garden pictures coming soon! 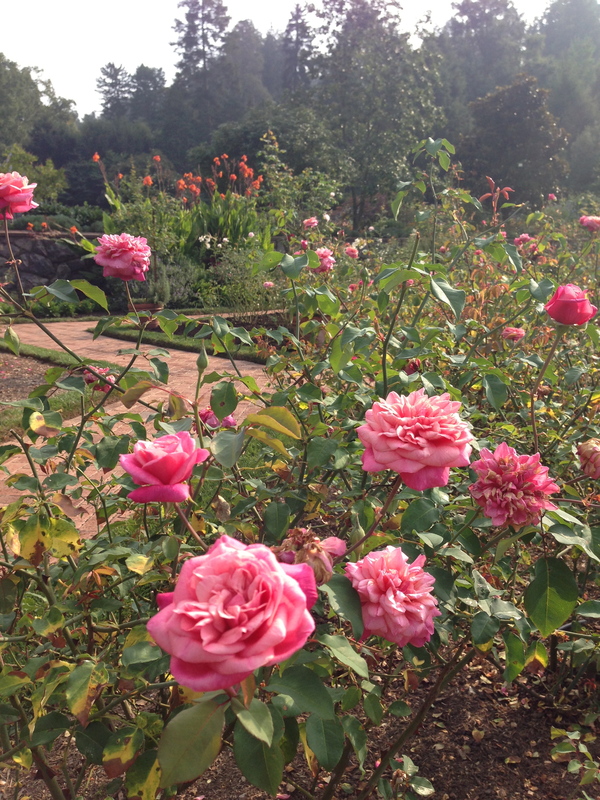 And, oh what a rose garden it is! 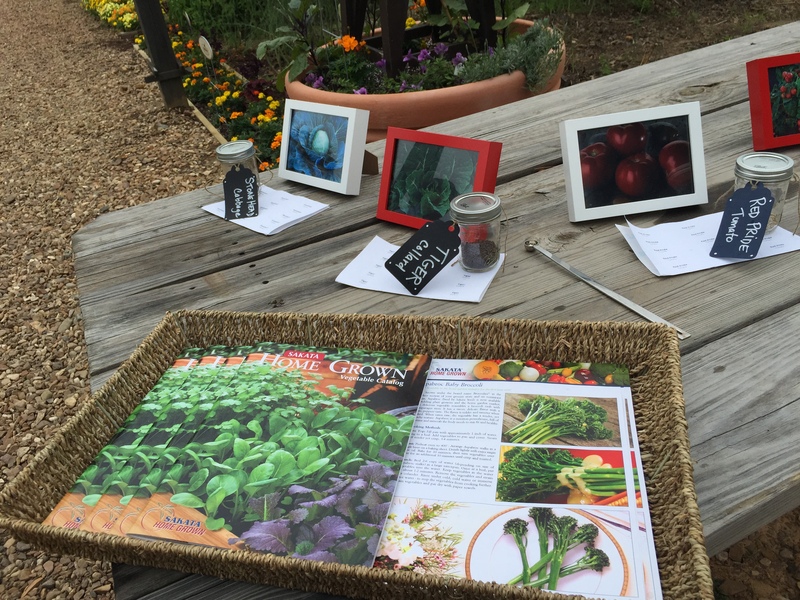 I love the concept of garden 2 table … cooking with the fresh food you grow yourself. My mother was a great gardener and she grew just about everything we ate. Because she canned and froze the extras we had food from our garden year round. (You can read more about her here.) But, if I am honest, my veggies keep getting inched out by roses and a couple of honey locust trees that are devouring our garden. However, we still have room for herbs and tomatoes — Mr. G makes sure of that. So, around here we are extremely grateful to area farmer’s markets to provide us with the other produce we love. So many of my friends tell me they rarely cook anymore since their time is so limited! But, good news, there is someone who is inspiring us to get in the garden and in the kitchen by teaching us just how easy, fun and nutritious Garden to Table can be. My friend P. Allen Smith. 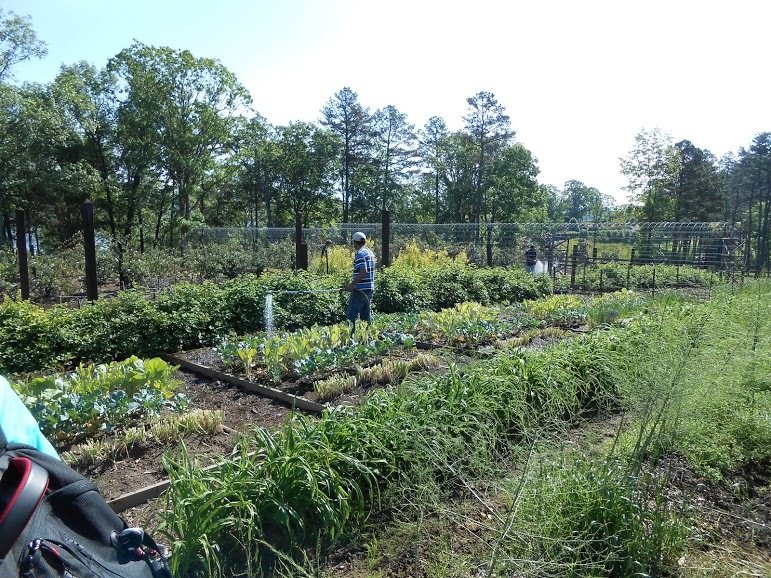 Allen grows an acre of the most beautiful organic veggies you have ever seen and he is always testing new plants and gardening ideas. PLUS, he is a creative master in the kitchen. Or through his wonderful books, digital publications and you tube videos. Take advantage of all of these easy-to-use resources to be a master in your kitchen, especially if you are like me and spend most of your extra time in the garden and need all the tips and tricks in the kitchen you can get. Follow Allen’s Garden Home Facebook page here for regular updates on what he’s cooking up in the kitchen and what’s going on in the garden. Don’t miss Allen’s most recent video for a Squash & Zucchini Casserole with Quinoa … can you say, “healthy comfort food you can feel good about.” I can’t wait to make this one! Take a look here. 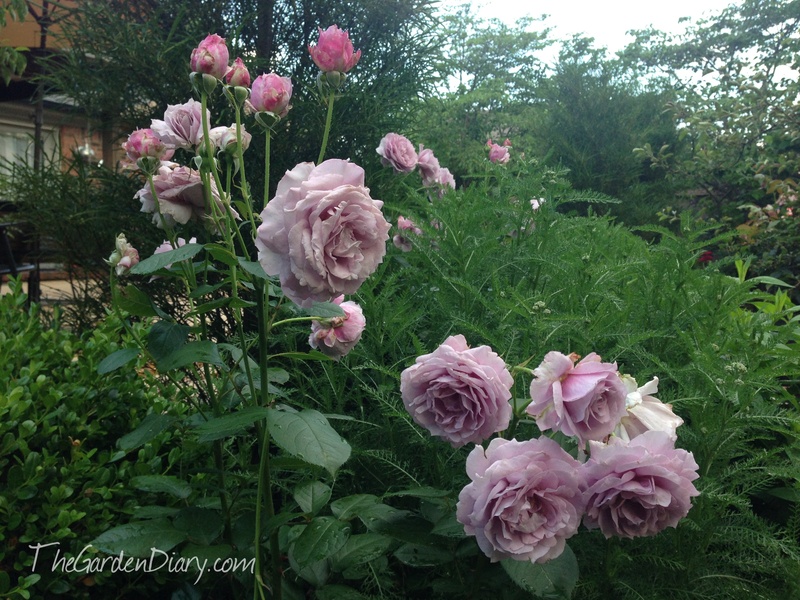 Coral Drift … I first saw this rose growing in P Allen’s herb garden and just had to have! Poseidon Floribunda from the Simply Brilliant collection from Certified Roses. Check out their roses here. 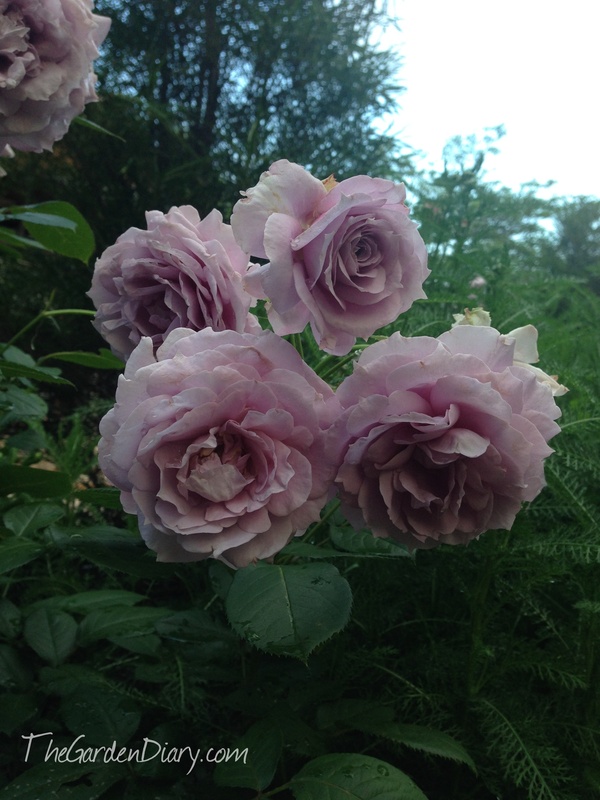 David Austin’s lovely Claire Austin. 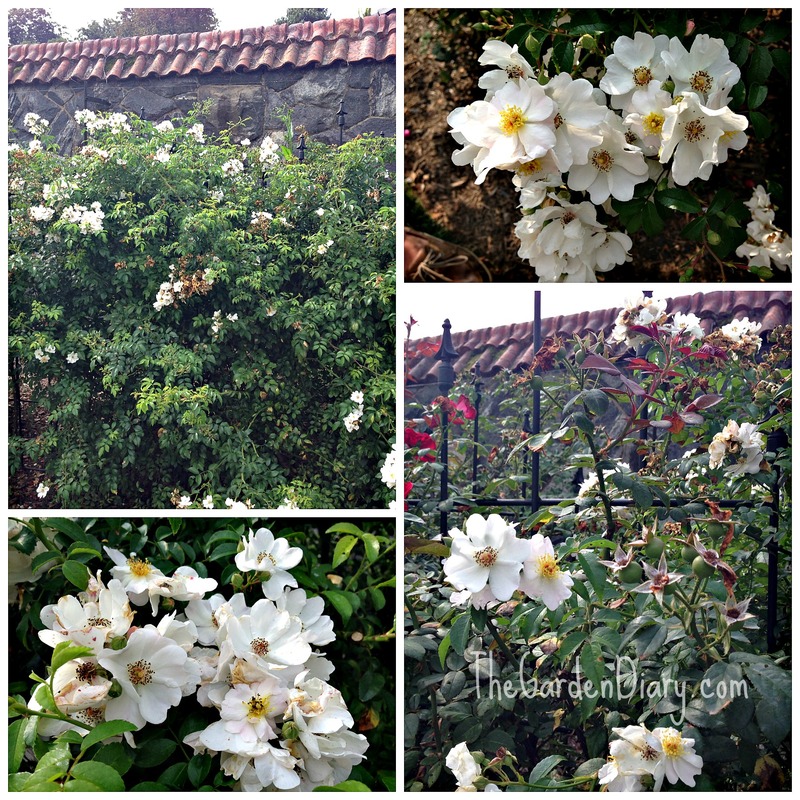 The healthy blooming machine … Amber Carpet Rose. Another shot of Poseidon. I can’t get enough of this rose! Etoile des Violette clematis … perfect paring with New Dawn Rose. 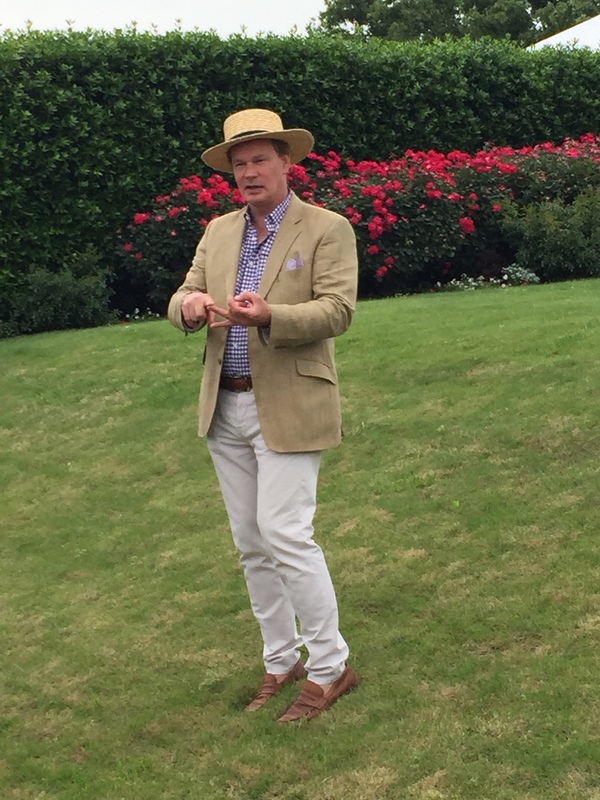 P. Allen Smith has created Mecca for garden bloggers … GARDEN 2 BLOG. A place for information, inspiration, refreshment, education and community! All in one of the most beautiful places on earth — his Moss Mountain home. Take a look here! There are so many highlights of this beautiful retreat, but I can honestly tell you that I can’t wait for my return visit to Allen’s beautiful rose garden. 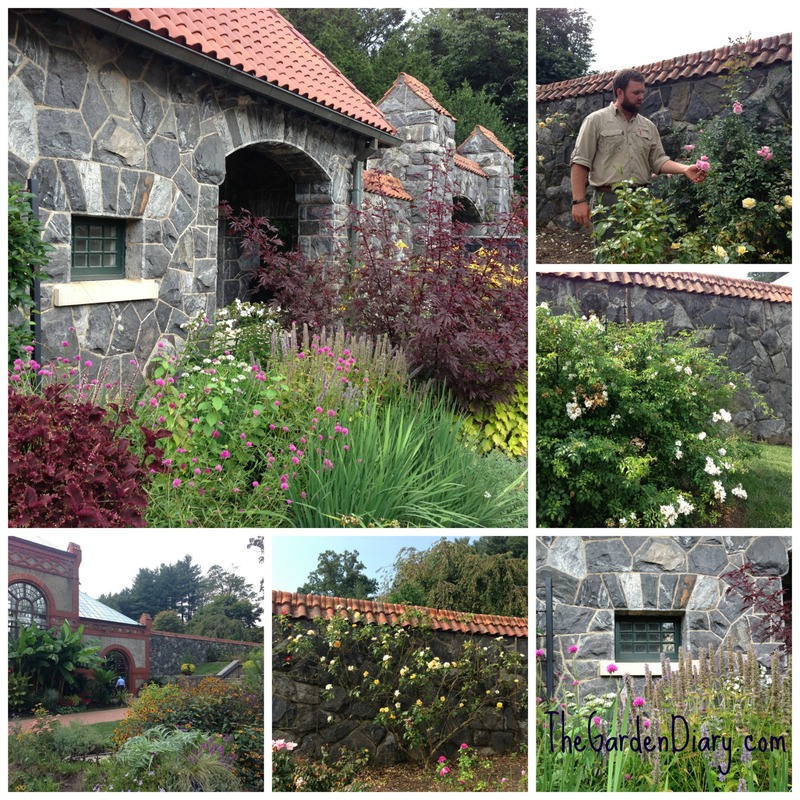 Allen is a true lover of roses and is committed to a beautiful AND sustainable rose garden. See the pictures here. For several years now I have been touting the idea of the Garden Home, a place that blurs the lines between indoors and out. It is my belief that a Garden Home is not just about beautifying our surroundings or extending our living space; it also helps us stay close to the earth and reminds us to be good stewards of our environment. The Garden Home is about living life at its natural best. I believe we can create a stylish lifestyle in keeping with the tradition of the past, while taking full advantage of modern innovations and still be good stewards of the earth. 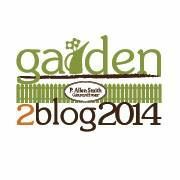 I am honored to be invited for a return visit to Garden 2 Blog. I am looking forward to seeing all the changes to Moss Mountain, visiting with so many special friends and meeting new friends! A wonderful group to learn and grow with! 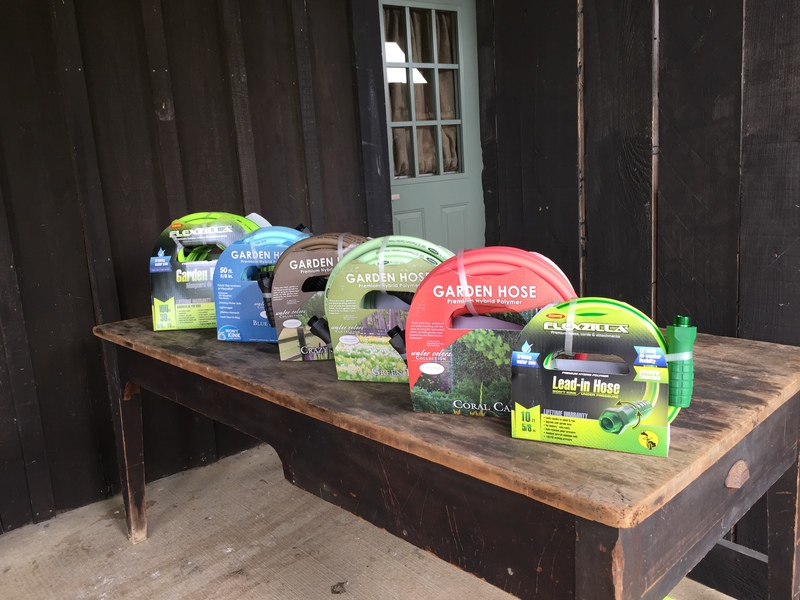 Many sponsors of garden/home related products are a part of making this special event happen and will join us to share the latest and greatest from their world. I’ll keep you updated! 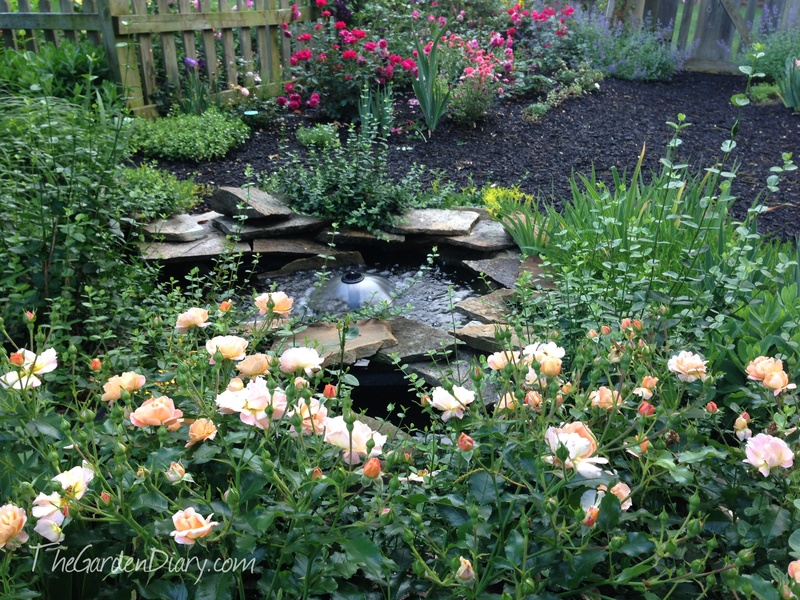 The best of the best from the world of gardening..
A part of Garden 2 Blog is fun garden projects. Our first project started last week with a video “throw down” for Jobe’s Organics. 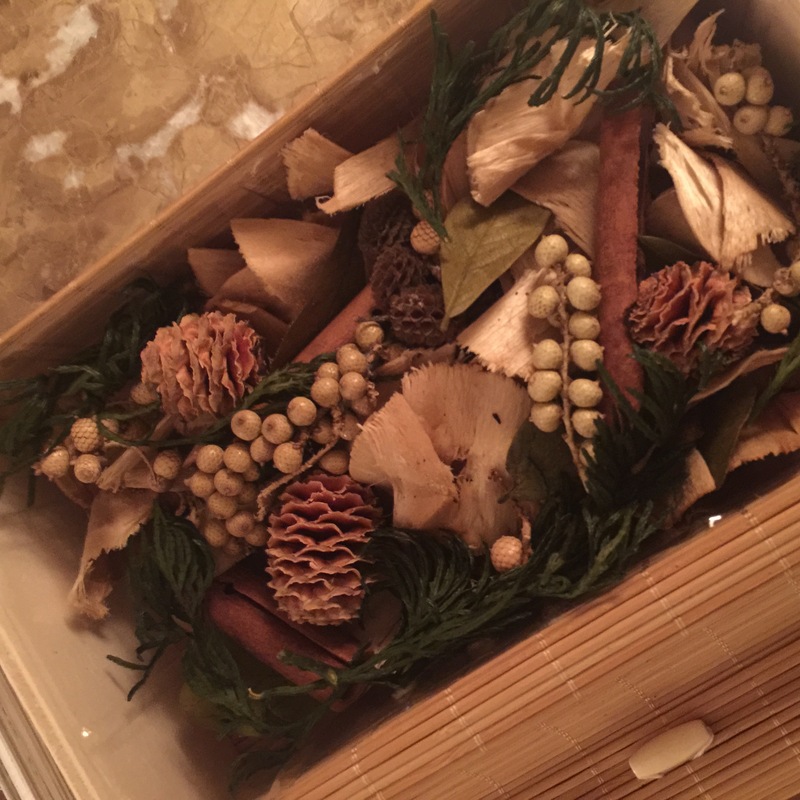 Jobe’s sent us all the “ingredients” for a container garden of our choice. I hope things are going well in your world this week. 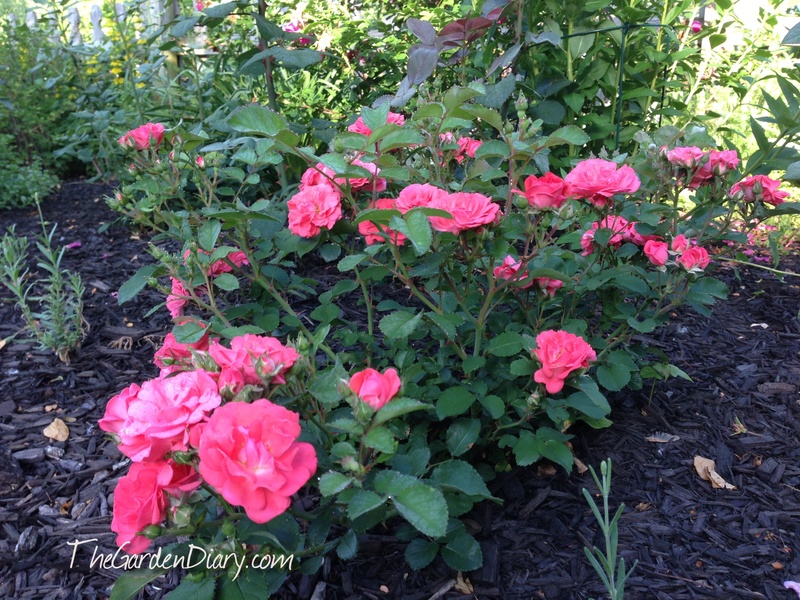 Leave a comment and let me know what’s going on in your garden! 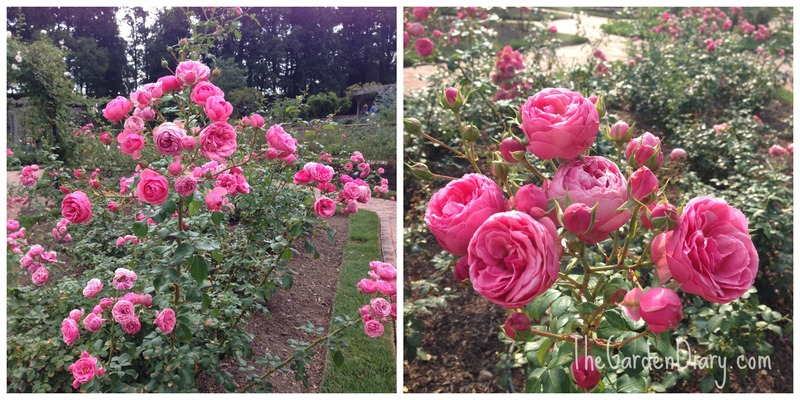 Recently we had the pleasure of visiting the Biltmore rose garden. 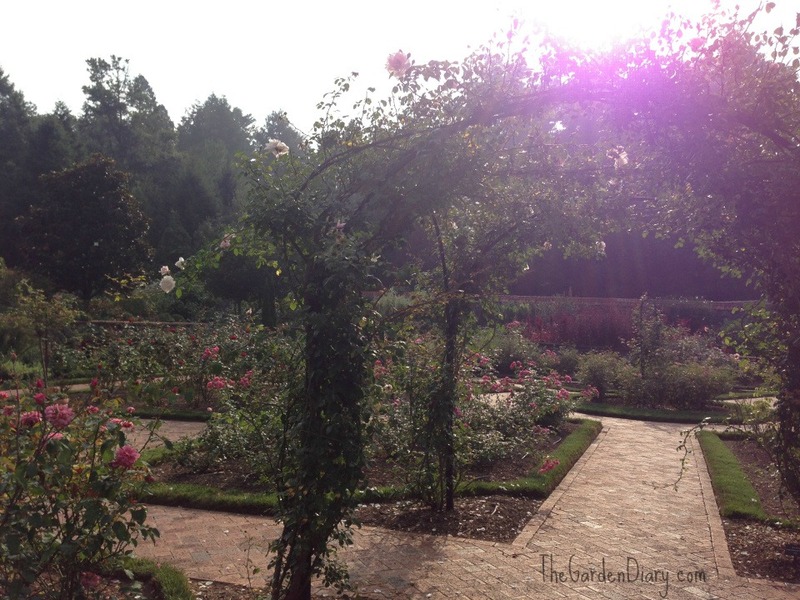 We arrived in Asheville on Friday evening too late to go to the garden, but that was okay with me because I wanted to see the rose garden in the early morning! I was up really E A R L Y and chose to forgo breakfast so I could be the first visitor to the garden. This meant Mr. G was going to forgo or at least delay breakfast too so he could deliver me to my destination. It worked! I was first on that a misty late summer morning! 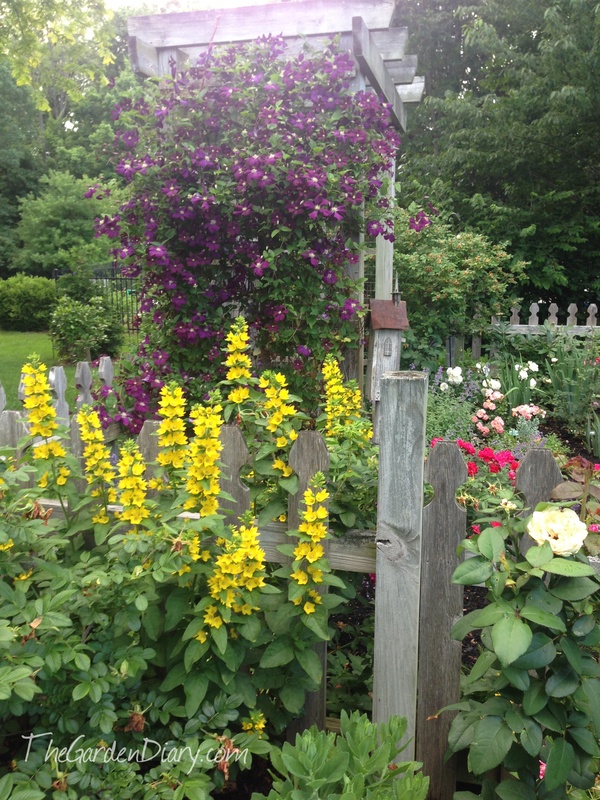 And, I was greeted with much fanfare by the bees, hummingbirds and gold finches–just the way I like it! 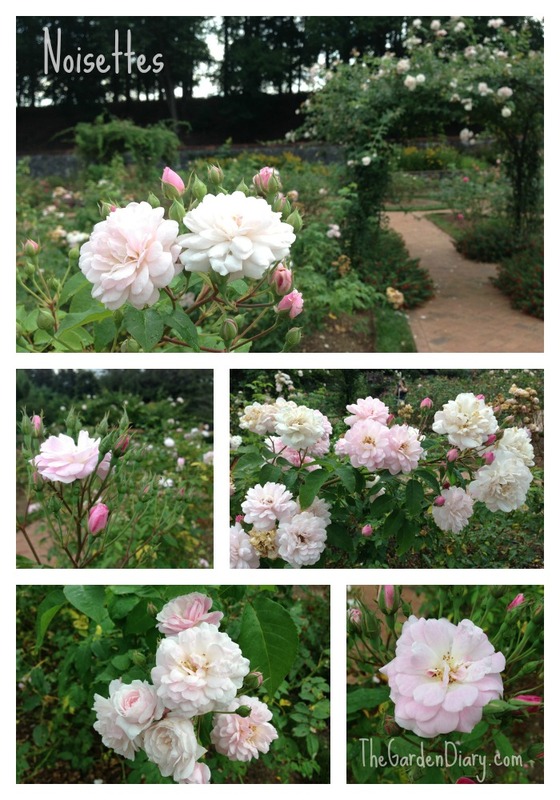 The Biltmore rose garden is completely surrounded by a tall stone fence and the setting will just take your breath away. 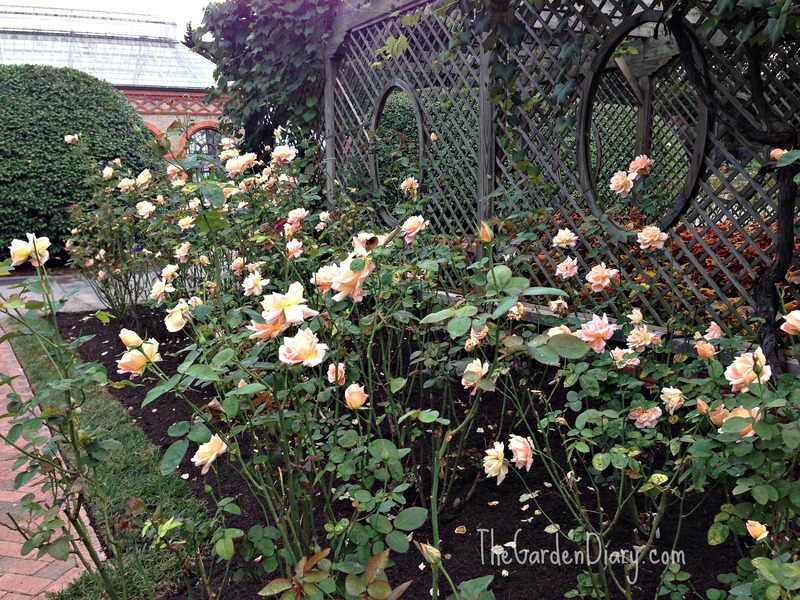 This garden is one of America’s finest rose gardens but gives you a truly international experience… of the 1400 roses, there are roses that were grown at the end of the 19th century plus many of the modern varieties. 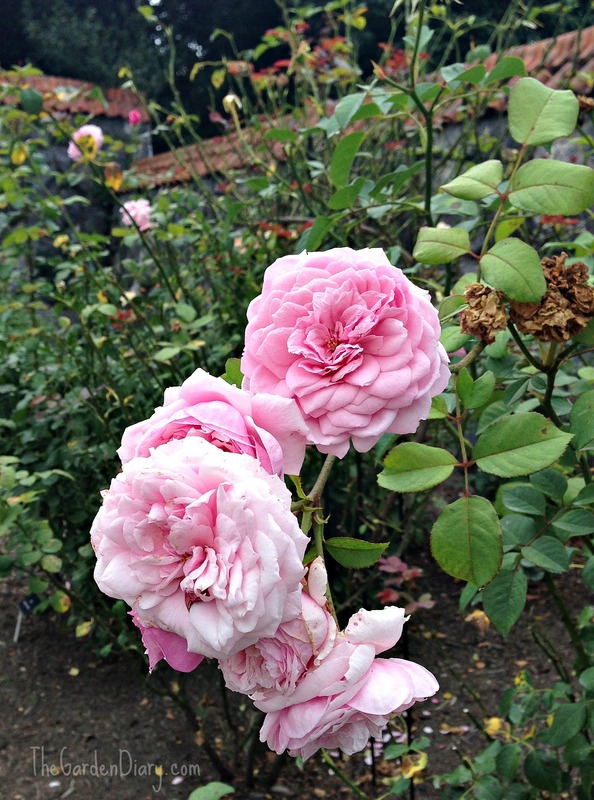 There are lovely English borders complete with David Austin English roses like Molineux and Princess Anne; Pink Pet China Roses; roses with French names like Monsieur Tiller to compliment the 250 room chateau–and then there are the American hybrids Blush and Champney’s Pink Noisettes—even though they don’t sound American. 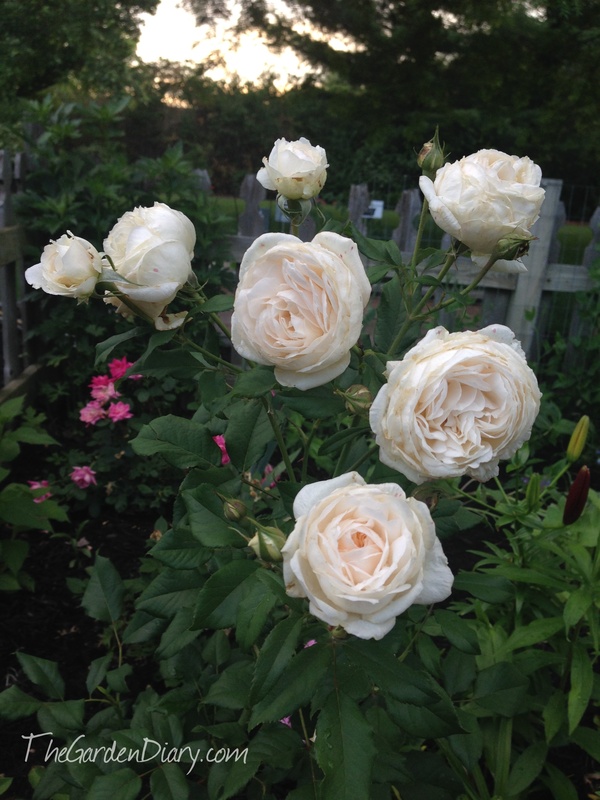 For the scoop on Noisette Roses, read an interview with P. Allen Smith here. 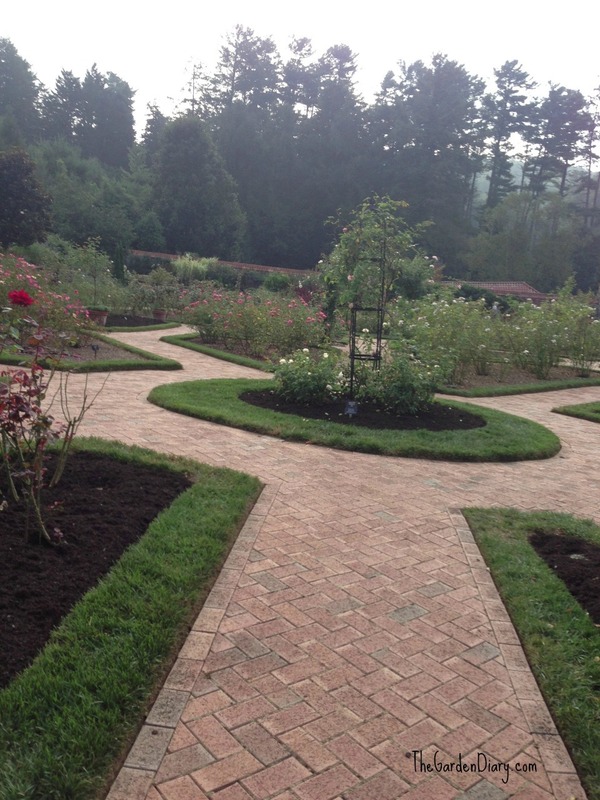 This beautiful garden design and all of these rose varieties work together beautifully under the watchful care of Lucas Jack and his team of staff and volunteers. Lucas’ expertise and enthusiasm is a winning combination. We had the pleasure of a personal tour by Lucas. He shared stories of their commitment to historical research in choices of plants for the garden and garden structures, how he keeps the plants healthy as well as his plans for the future. We are in the process of scheduling his next visit to ROSE CHAT, so you can hear all the details from him too. 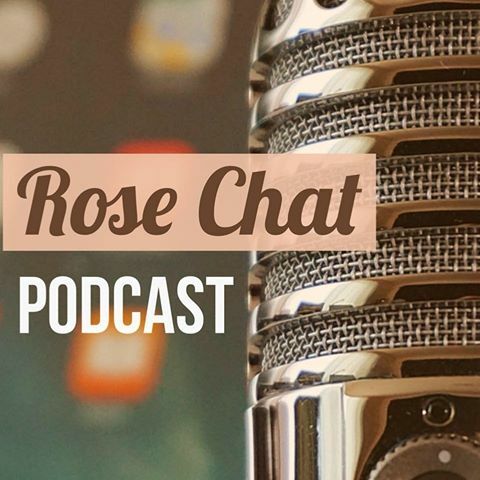 If you missed Lucas on Rose Chat Radio in July …. LISTEN HERE. 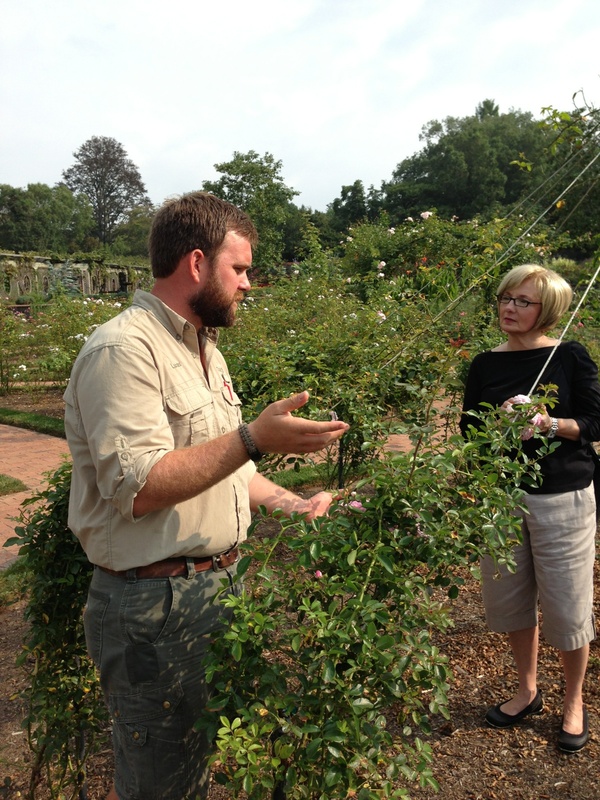 You don’t want to miss Lucas’ chatting about his advice for the next generation of gardeners as well as discussing good growing practices and companion planting for roses. 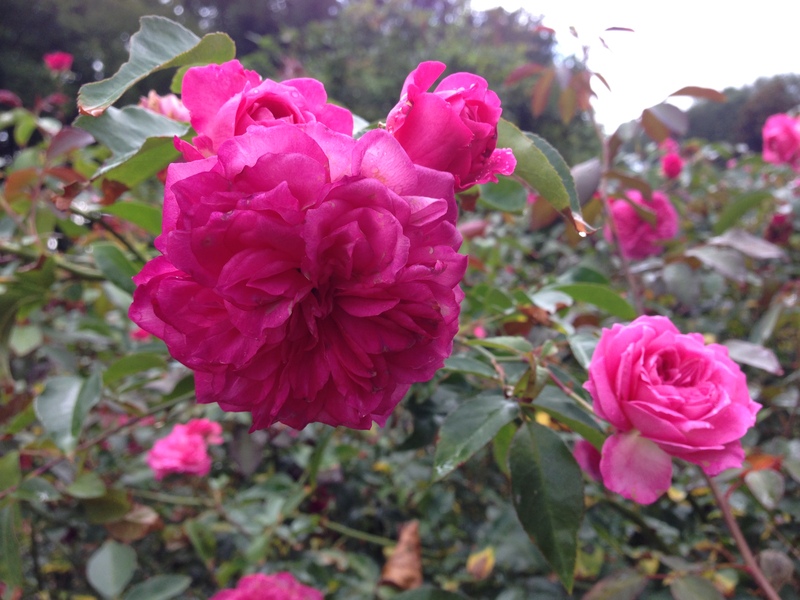 Mike Athy’s pink rose … very fragrant! 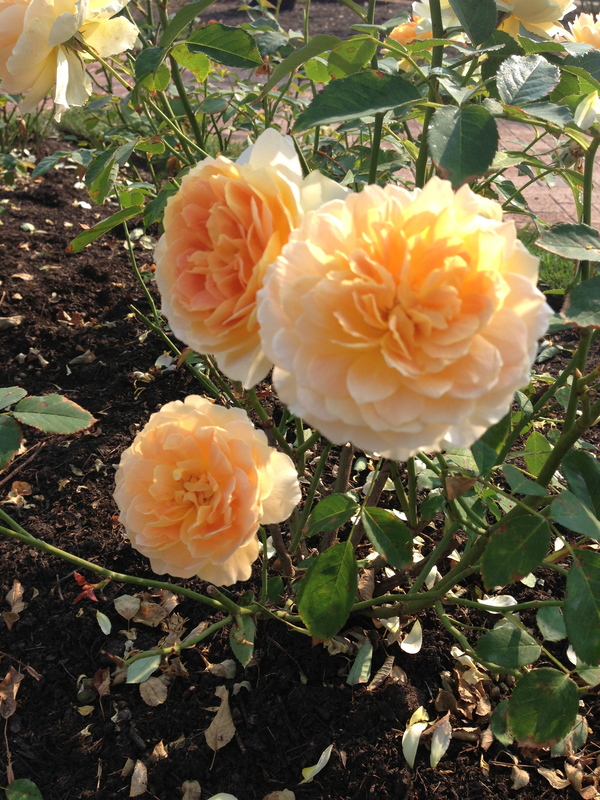 For more information about the rose trial winners, read on. HAVE YOU BEEN TO THE BILTMORE? There is so much to see and experience at the Biltmore. The house, the grounds, the mountains, the conservatory ……. the rose garden!! Thanks Lucas for a lovely day in your enchanting garden!